MOXEE, Wash.- Local authorities say a plane had make an emergency landing near Moxee. The Yakima Sheriff's Department was alerted by Yakima Air Terminal that a Cessna 170 plane flying near the Yakima Training Center lost engine power. Law enforcement agencies from the Yakima Sheriff's Department, Union Gap Police Department, Moxee Police Department, Washington State Patrol and East Valley Fire blocked off Highway 24 between University Park way and Beaudry Rd. to create a makeshift landing strip. Yakima deputies say the plane never showed, so police and air patrol searched for the lost plane. They say two people were inside the plane, the pilot and his wife. 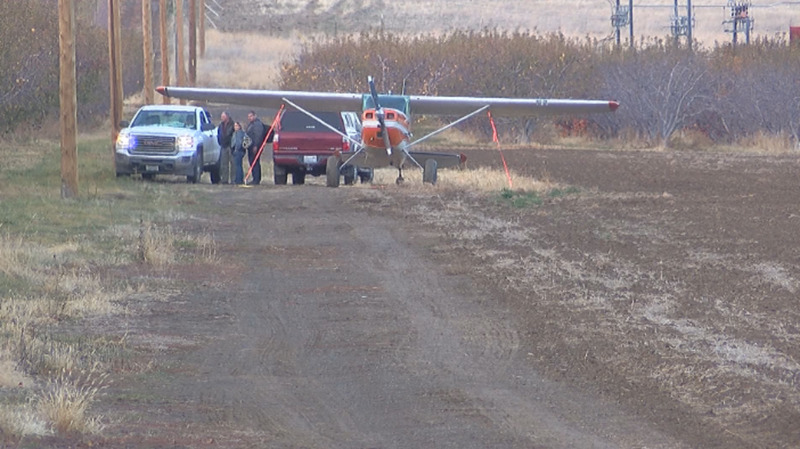 Yakima Deputies say the plane ended up landing safely. "They landed in a very soft field out here adjacent to Highway 24 mile post 22. The plane sustain no damage other than the engine problem it has," said Yakima County Sheriff Brian Winter. "Cole did everything that he was trained to do and flew the airplane precisely to the ground. There was no damage, nothing scratched. It was a perfectly controlled landing," said Flight Instructor Mike Butterfield. Butterfield says he taught the owner of the Cessna 170 how to fly planes. Yakima deputies say neither the pilot nor his wife were injured in the landing. 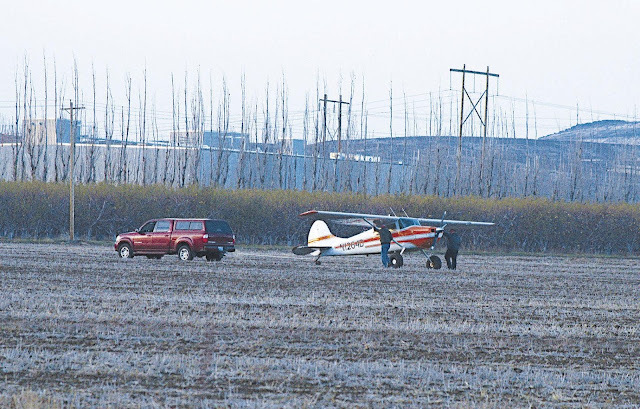 MOXEE, Wash. — A Yakima couple were uninjured Saturday afternoon when their Cessna 170A glided into a plowed field 16 miles east of Moxee. Cole Reason reported that the engine had quit on the aircraft around 2:18 p.m., prompting the closure of a 2 1/2 -mile stretch of State Route 24 and an aerial search involving the U.S. Army and the Civil Air Patrol. Reason, 36, was flying with his wife, Kathy, back to the Yakima Air Terminal when he reported engine trouble about 7 miles north of the highway, said Yakima County sheriff’s Sgt. Chris Gray. Sheriff’s deputies, East Valley firefighters, and police from Union Gap, Moxee and the Washington State Patrol closed the highway between Beaudry Road and University Parkway so Reason could use it as an emergency landing strip. The closure was lifted 10 minutes later when the plane did not show up, Gray said. An aircraft from the Civil Air Patrol, a volunteer pilot and an Army helicopter crew from the Yakima Training Center conducted an aerial search, Yakima Air Terminal Director Rob Peterson said. Peterson said the helicopter crew spotted the aircraft sitting in a field on the north side of the highway, and firefighters, sheriff’s deputies and an airport crew went to the field. Gray said the plane, which Federal Aviation Administration records show was built in 1951, was not damaged during the landing. Among those who headed out to search was Mike Butterfield, Reason’s flight instructor from Yakima Aerosport. 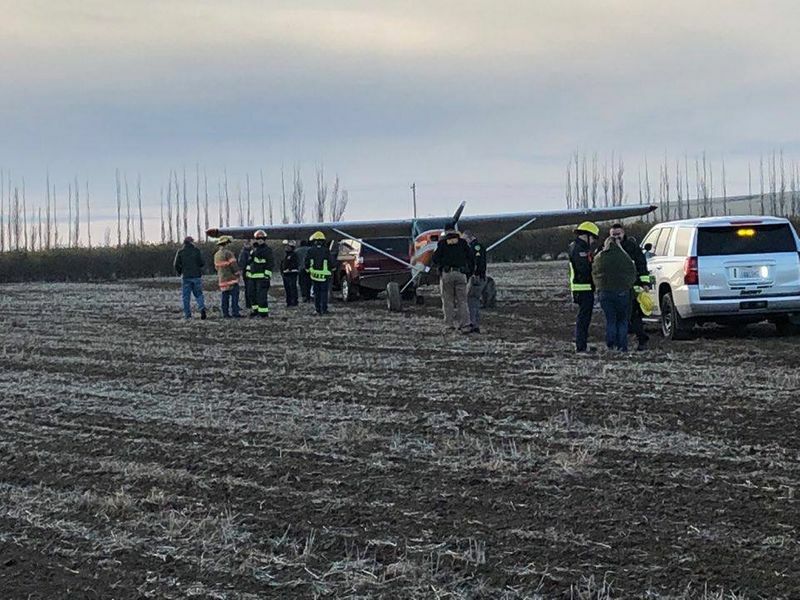 Butterfield, who got involved when he learned Reason was having trouble, said Reason told him the engine quit and that he glided to a landing in the field. “Kathy was so proud of Cole for knowing what he was supposed to do,” Butterfield said. Butterfield said he helped Reason secure the plane in the field, and the plan was to remove the engine Sunday, repair and replace it, and fly the plane back from the field. YAKIMA- A small plane had to make an emergency landing in a field after the engine lost power. Around 2:17 p.m. Saturday a pilot reported to have lost engine power to his aircraft approximately seven miles north of State Route 24 near Moxee. Units from the Yakima County Sheriff’s Office, Moxee Police Department, Union Gap Police Department, Washington State Patrol and the East Valley Fire Department responded and closed State Route 24 between University Parkway and Beaudry Road to provide a landing strip for the airplane. When the aircraft did not arrive, units conducted an area search. The Civil Air Patrol also had a plane conducting a grid search for the lost aircraft. A short time later, information was received that the plane had landed in a field at mile marker 22 along State Route 24. The pilot, a 36-year-old Yakima resident, stated that his 1951 Cessna 170’s engine suffered from a mechanical problem and the aircraft lost power. He notified the Yakima Air Terminal tower of his situation and found in which to land. The plowed field ran along the north side of State Route 24 at mile post 22 east of Moxee. The plane was not damaged during the landing. Neither the pilot nor his 39-year-old wife suffered any injuries in the incident. The Federal Aviation Administration and National Transportation Safety Board were notified of the incident.